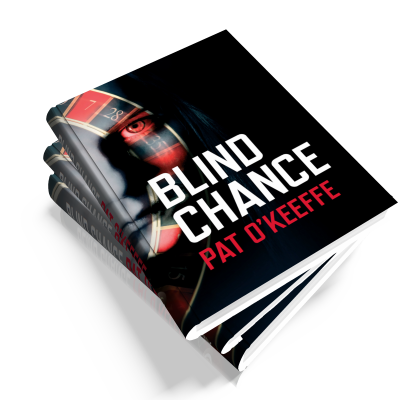 Pat is a member of the Crime Writers Association and the Society of Authors, having written four crime novels - Thermal Image, Burn Out, Blowtorch and Blind Chance. He also has three sports-based books published. Pat was born London, joined the army straight from school and after leaving the army joined the London Fire Brigade. In 2003 he completed thirty years of service; twenty three of them as an operational Station Officer. In 1981 Pat became a Member of the Institute of Fire Engineers. His novels, in the main, could be described as Urban Noir. Characters move through landscapes of light and shadow attempting to grasp control of their lives and impose an order that remains elusive and only glimpsed through a dark philosophical glass. Throughout his life his passions have been Martial Arts, Literature, Film and Walking. Pat competed in the ring as a kick boxer at international level and fought 28 times. His opponents included three World Champions - managing to lose to each other them! Pat is a 6th Dan [6th Degree Black Belt] in both Kick Boxing and Karate-Jutsu. Pat has a great passion for walking and has trekked in the Canadian Rockies, the Bernese Oberland in the Swiss Alps, Iceland, Snowdonia and many other places. Ex-croupier Kate Redmond is barely out of prison when the past catches up with her. Sean Malone, head of an East End crime dynasty, has gone missing in Amsterdam and his son, Michael, has been found in the Amstel River with half his head blown away. Kate has history with the Malones; she took them for some serious money before she went down and now it’s payback time. Tom Malone, the eldest son, wants Kate to go to Amsterdam and find Sean or her crippled partner, Kenny, will go through seven levels of hell. By nature, Kate is an intelligent and complex risk-taker whose choice of men hasn’t always been the best, but Kenny was different; she cannot abandon him. Amsterdam proves a nightmare world of assassination, cross and double-cross and Kate learns fast that there are no rules or limits. With events spiralling out of control, she is forced into an alliance with the most dangerous man in Amsterdam, Jan De Klerk and now it will take every ounce of her wit and nerve if both Kenny and she are to survive. Violence, latent eroticism, drugs and sleight-of-hand are the key markers in this fast moving thriller.